Fresh raw cream is thick, silky glory and tasty. The texture it lends to the dishes (both savoury and sweet) enhances deliciousness. 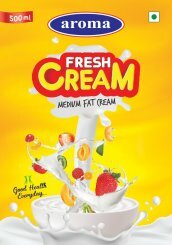 Cream is particularly dense in fat (have higher fat content), have a richer texture and more flavorfull taste. Cream do not curdle easily when they are used in cooking. The quantity of butter fat in cream determines how easily it can be whipped.